The Sunbus bus network has changed, and not everyone is impressed. The new timetables are now online and are confusing many regular commuters and drivers as well it seems. 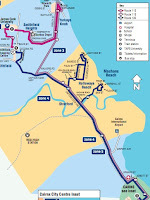 For instance, northern beach services now centre around Smithfield as a hub. There are only three morning and three evening services direct to Yorkeys Knob, other than those times, you will need to transfer at Smithfield Shopping Centre. There was outcry across the region a month or so ago, when Sunbus proposed to remove a number of services, and effectively making commuters to connect to other bus services, many which didn't connect within a reasonable time, especially around popular morning and evening times. 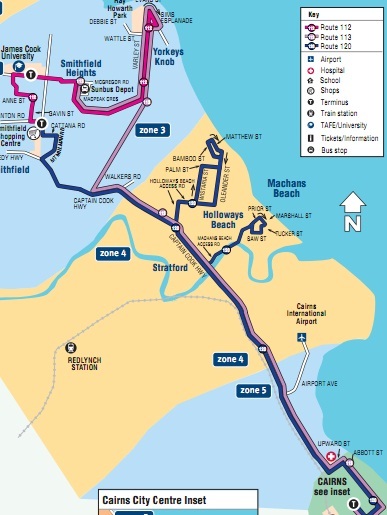 If you are a bus commuter, I suggest you check out the new timetables and maps, to see if it will affect you adversely. I'd love to hear from anyone who can master and understand the new timetables in one sitting. This post a few months ago now from Club Troppo may be of interest. So why a smartphone app to track the buses? Wonder if the new timetable will allow them do some of that word called maintenance! I thought public transport was to transport the public...not to make a profit from buying and selling buses without using them very much. If they run at a loss where they are needed then governments subsidize them....don't they? We subsidize the politicians don't we??? then why not the buses. Ah well! I'm sure Kirsten L will make the buses run on time just like Mussolini and the trains. Great way to make bus companies do the right thing, is quite simple. Launch another bus company in direct competition. Watch them get their act together when that happens, as it is all over Australia. The same event should take place with Black & White Taxis, just to smarten up their act, thereby forcing them to quit being a law unto themselves. Monopolies such as these should continually be questioned and put in their place. Neither of these companies could exist financially without the constant patronage of the public. Remember: Don't Lie, Cheat or Steal, the government HATES competition!